We use an exciting website called Charanga Musical School in all our music lessons. This helps to teach musical knowledge and skills through learning to sing, play instruments, improvise and compose to many different pieces of music from different genres throughout history, including rock and pop! We perform in class at the end of every lesson. Please scroll down to see Key Stage 2 videos. In Key Stage 1 children learn about key musical concepts through singing and playing percussion instruments including djembe drums and glockenspiels. All Key Stage 2 children learn how to play the recorder in Year 3. 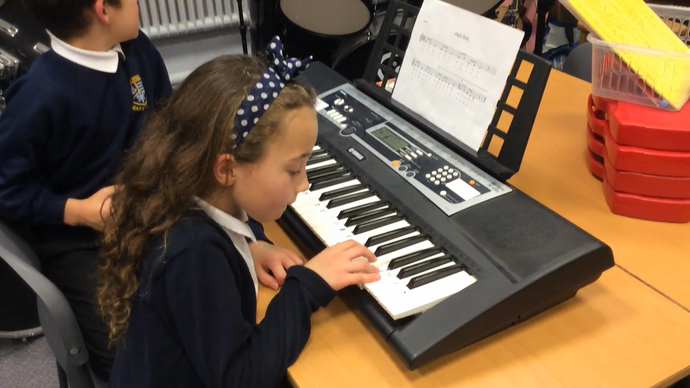 From there they continue to develop their musical knowledge through singing and playing a variety of instruments, including glockenspiels, keyboards, various percussion instruments and steel pans. Children in Key Stage 2 also have the opportunity to access Charanga Music World at home to support and enhance their musical learning. Key Stage 2 children have the opportunity to sing in a choir after school and in Year 6 there is an orchestra club on a lunchtime. 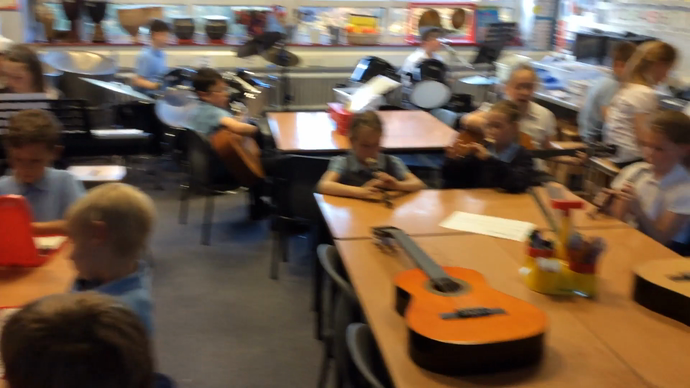 From Year 4, children have the opportunity to have guitar lessons in school. These are provided by a private music teacher and are paid for by parents. In Key Stage 2 we have drum kit lessons, again paid for by parents, provided by the East Riding Schools' Music Service. Choir children compete at Hornsea Music Festival in July and there are many more opportunities for children in music clubs to perform throughout the year, including the Big Brid Sing at Bridlington Spa, singing for pensioners, Christmas concerts, our Year 6 Leavers Show and other community events. Children have the opportunity throughout the year to experience live music with visiting groups and concerts from the Schools' Music Service. We now have more extra-curricular music lessons available for the whole school through a new outside service called 'Music Box'. They provide lessons in keyboard, drum kit and general musicianship. Parents will need to pay for this service and communication is directly between parents and Music Box itself, however lessons take place within school time. If you are interested in any extra-curricular music opportunities for your child, please enquire at the school office. The children in Key Stage 2 perform in class at the end of every lesson. This is recorded on video and watched back so that the children can see and hear their progress. There are also sometimes opportunities for them to perform to other children and parents in assemblies and shows. Below are some videos of some of the children's performances. This Year 4 class used their knowledge of notation to work out how to play 'Jingle Bells' using correct fingers on a keyboard. They worked in pairs and helped each other. 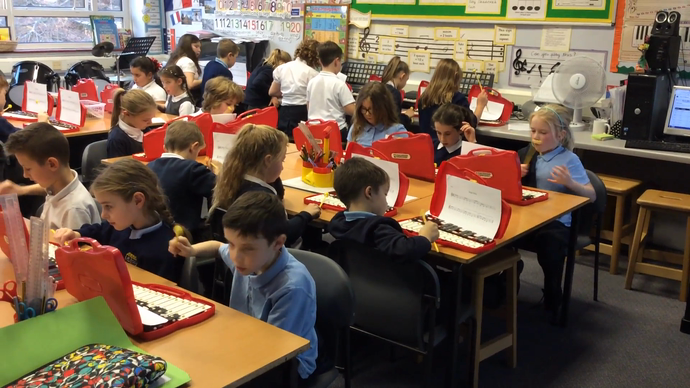 Some pupils could help the others more as they have extra-curricular keyboard lessons with 'Music Box'. 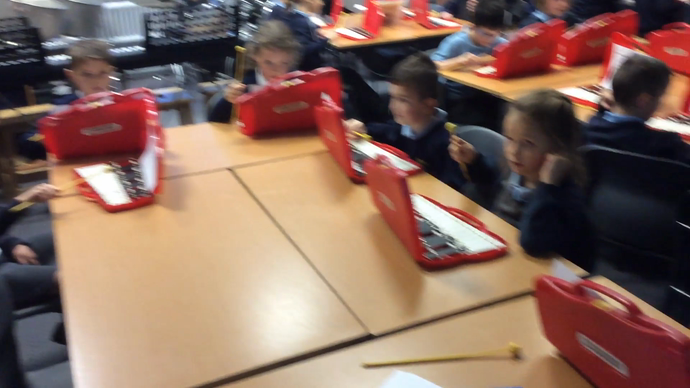 This Year 4 class practised the whole tune of 'Jingle Bells' on glockenspiels then listened very carefully to each other to play the first section together in time. 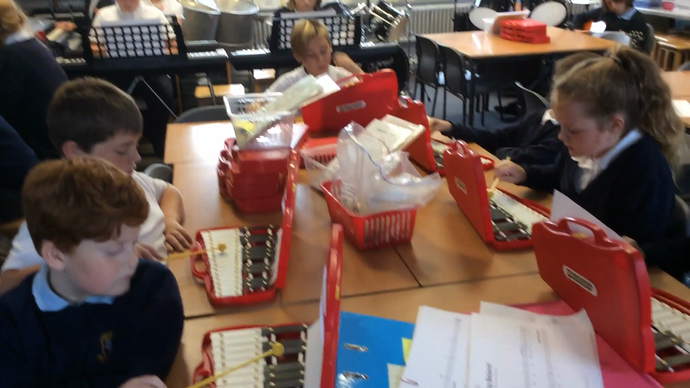 Year 6 listened to the beat of the drum kit to play three different parts together in ensemble on glockenspiels, recorders, guitar and keyboards.This class were lucky enough to have four children who could play the melody part to complete the piece. Year 3 had to listen to the beat of the backing track carefully to play two different sets of notes together in time. There were a few children who had extra curricular guitar and drum kit lessons in this class so we focused on the easy and medium parts and played in ensemble with both drum kits keeping the beat. The guitar pupils only played the notes they had learnt in their lessons so they had to count carefully to know when to join in with the others.